The Concordia Student Union is ready for court. For six months, the CSU has tried to sever its ties with the Canadian Federation of Students—a national lobby group that represents college and university students—through democratic means. Now, the student union will be taking its case against the CFS before a judge. 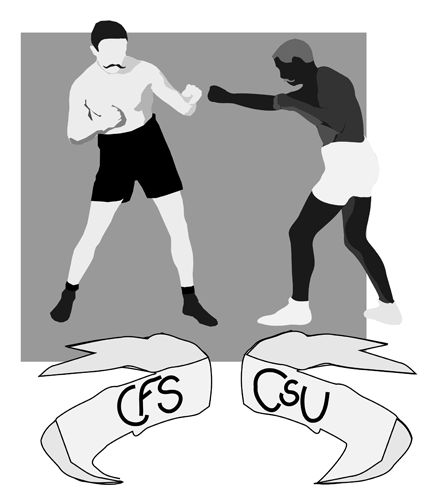 On Aug. 18, Osei told The Link that the union would be seeking a declaratory judgment to determine whether or not they are still legally a part of the CFS. Members of the CSU and CFS will be brought before a judge and asked to testify under oath. The ruling will determine the CSU’s membership status within the CFS, and whether or not the student union owes the CFS the $1,033,278.76 in unpaid membership dues claimed by the lobby group. Both the CSU and Concordia University have been unable to find any proof of unpaid dues, a claim made by the CFS a month before the student union’s general election. “If the judge rules in our favour, then we won’t owe the CFS the $1,000,000 they claim,” said Osei. Even a favorable ruling for the CSU could mean that the student union would have to pay the CFS up to $600,000 in unpaid membership fees. Last year, the CSU withheld payment of its dues as a protest against the lobby group. A recent change in the CFS’ by-laws—passed after Concordia students voted to leave the organization—stipulates that members wanting to leave the CFS have to pay an additional year’s worth of dues before being able to opt-out. The judgment could avoid years of legal fencing between both parties. Last spring, two other Quebec members of the CFS held referendums about continued membership in the lobby group. Graduate students at Concordia and McGill University voted overwhelmingly against remaining a part of the CFS, although neither referendum has been recognized by the CFS. The CSU abided by referendum rules approved by the British Columbia Supreme Court after Kwantlen College attempted to defederate in March 2008, eventually leading to its own court showdown.